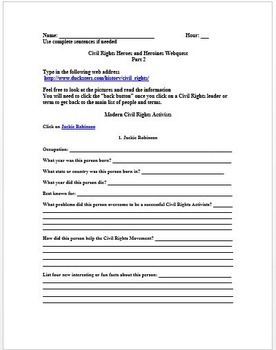 Students will gain basic knowledge about seventeen significant civil rights activists from the 1800s and 1900s. 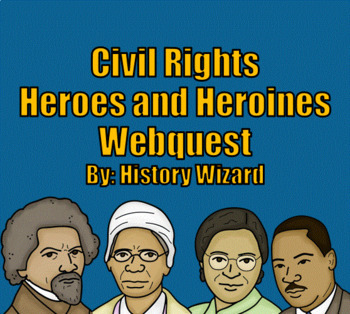 The Civil Rights Heroes and Heroines Webquest uses the following great website. The clip art is from Teacher Resource Force. My students enjoy learning new facts about important civil rights activists from the website. I usually use this activity as a review or introduction activity for my middle school students and it takes at least one to two class periods for my students to finish. Feel free to modify this activity if needed to fit the needs of your students. The webquest can also be broken into two chronological parts if needed. What state or country was this person born in? What year did this person die? What problems did this person overcome to be a successful Civil Rights Activists? How did this person help the Civil Rights Movement? 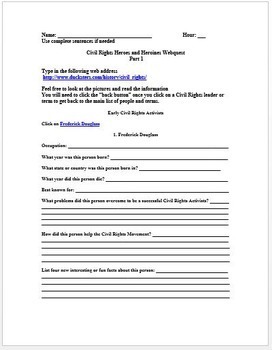 Please check out my other African American History and Civil Rights lesson plans.